Tonight I ventured into the city to have a drink, meal and catch up with two very dear friends, Kath and Kaye. I worked with both the girls at the Tasmanian Travel Centre for quite a number of years. Kaye now lives in Sydney with her partner Danny and her beautiful little girl Ava. Kath is now married to Paddy and is due to have their first child in April. I have said it before and have to say it again. Aren't friendships great when you don't necessarily see each other a lot but when you do you just slot back into the comfort zone - this is true friendship. 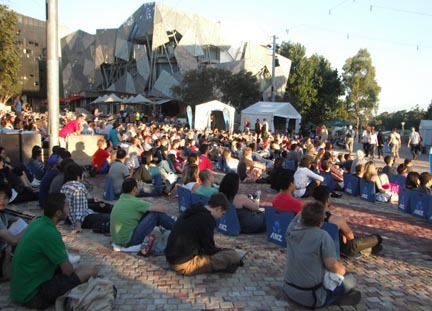 Melbourne is a bit of a buzz at the moment with the Australian Tennis Open being held at the moment. Tonight Roger Federer and Novak Djokovic were playing and lots of people were gathered at Federation Square to watch the game on the big screen. It was a beautiful summer night to be in the city and enjoying the sights and sounds of Melbourne. 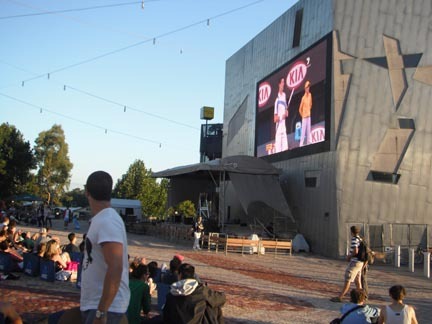 Crowds sitting at Federation Square watching Tennis on the screen. Sounds like a wonderful night! I love to get together with good friends!